Hey everyone! Welcome to the latest emission of Teen Jazz Radio, a part of TeenJazz.com, an online community of up and coming musicians. I’m Shannon Kennedy, your host and I’d like to thank you for taking the time out of your busy schedule to listen to our show and to the fantastic young artists we feature as part of each episode. 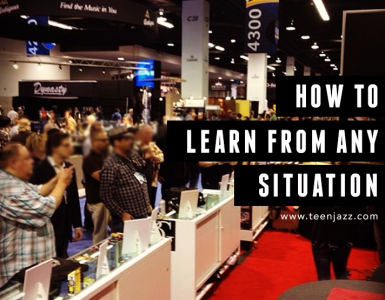 Today on Teen Jazz Radio I’m going to talk about developing good music habits. It’s important to practice everyday based on what your goals in music are and that’s easier to do if you make it a habit. Whether your goal is to continue developing your music, becoming an engineer or a songwriter, it’s important to spend time each and everyday to get closer to your goals, so we’re going to talk about how to make practicing (or songwriting) a habit. Also in this episode, I’m also going to feature the music of Ryan Saranich, Trifield Guitar Project, Bastian Weinhold, David Pedrick, This Time with Feeling and Jonathan Butler. As I mention at the beginning of each show, I know that many of you are listening to this podcast for different reasons – some of you may be here for the advice offered as part of this episode and some of you may be listening to check out the music we feature as part of the show. So, as I mentioned in the last episode, I’m going to try and space the music and the advice out evenly throughout the podcast so that there’s a little something for everyone. So, before we dive into today’s tips on practice habits, let’s check out our first music set. This week I’d like to introduce you to saxophone player Ryan Saranich and Trifield Guitar Project which features Alex Sill. The first song you’ll hear is I Don’t Think So by Ryan Saranich from Story and second I’m going to feature Montana Suite 3 (April Ballad) by Trifield Guitar Project from Montana Suite . Once again, the first track was Ryan Saranich with I Don’t Think So. You can learn more about Ryan in our interview with him on Teen Jazz or at his website, ryansaranich.com. And after that was Alex Sill with Montana Suite 3. You can also read his interview with us on Teen Jazz. Habits, good or bad, they are part of who we are, what we do and who we become. It’s not only important to create habits surrounding our music, but good habits. But why are good practice habits so important? Isn’t it enough to just spend time on our instruments or writing music? Practicing something incorrectly can really hinder our playing, so it’s imperative to develop good practice habits. And it doesn’t hurt to check in with a teacher or your peers every so often to make sure you’re keeping on track! If you spend too much time trying to work things out on your own, you may find you develop bad habits that hold you back or make certain aspects of your playing/songwriting more difficult than they need to be. Someone who knows what they’re doing, like a teacher, can help you avoid this. As you play longer and have a few more years on your instrument, this becomes less important, but at the beginning when you’re first starting out, it can be crucial. A quick example I have is with one of my students (this has actually happened in more than one case). This particular student came to me for lessons because his mother saw that he was struggling and wasn’t as excited about music as he had been before he started. When he came in I saw that he struggled to play and was having a really hard time. I took my mouthpiece to play his sax and found that the saxophone wasn’t working. At all. He was being held back by his instrument, not by any inability to play on his part, but that frustration had made him feel like quitting. He had no idea his saxophone wasn’t working because he had only been playing a few months and one can’t have expected him to know something like that. He took his sax in to get it fixed and is now really enjoying music. So, to make a long story short, if you’re just starting out, it’s definitely worth checking in with someone every once in a while to help point things out you may not have noticed and give you some direction. It’s been said that it takes about 21 days of consecutively doing something for it to become a habit. So if you can practice each day for at least 15 minutes for 21 days, you have a pretty good chance of it getting easier to sit down and do on a regular basis. So how do we make practicing a habit? If you hope to train yourself to develop good practice habits, to try and work on your instrument or voice or songwriting everyday, it needs to be something you’ll miss if you don’t do it. Like brushing your teeth, eating dinner or your morning cup of coffee. There are a few “hacks” to make music a more regular part of your schedule and so here are just a few ideas. One of the most suggested ways to make something a habit, is to set aside a specific time in your schedule just for whatever it is you’re trying to do. In this case, practice. The mornings are often best because you haven’t yet become overwhelmed with other side projects, tasks, calls or emails, but sometimes the evening works too. When I was in school, I sometimes woke up early to practice before classes started. Other times, I practiced right after I got home and before I did my homework so that I wouldn’t be too mentally exhausted to tackle it. It wasn’t long before it was natural to come home and open up my flute case right away. With this method, the most important thing is to pick a block of time and stick with it. Always practice during that time until your brain and body become so used to doing that it automatically switches into practice mode at said time. Another method, if you have the space, is to create a dedicated practice area free from distraction so that each time you step into that room or corner, you know what you’re there to do. When you’re in this area (or when it’s your dedicated time), make sure that others (parents, siblings, spouses) know not to disturb you. If you have trouble focusing, try practicing for shorter spurts of time rather than trying to survive an hour long practice session. If you force yourself to sit for too long while your mind and body are fighting against it, you’re going to come away far more exhausted than necessary from your practice sessions and you won’t look forward to the next one. When your practice time is over, try to make a note of things you’d like to work on the next time so you have a place to start the next time you sit down to practice. Sometimes one of the hardest things about practice is choosing exactly what to practice. By keeping a practice journal and making notes as you work, you can eliminate this lack of direction so that you always have something to work on. This will also help prevent you from hitting a plateau. If you aren’t used to practicing regularly, it’s more difficult to stay on track. Your body may not have the endurance quite yet so don’t push yourself too hard. If you don’t enjoy it, you’ll come to dread your regular practice sessions and avoid them rather than look forward to them and go through with them. You won’t enjoy everyday of practice, but there’s not reason to dread it or stop all together! If you get too frustrated, overwhelmed, or bored, you’re likely doing it wrong. 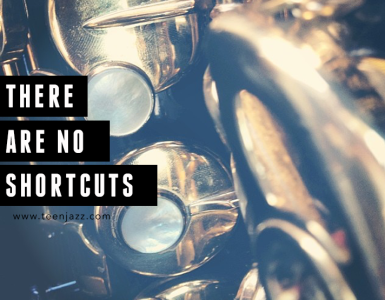 You don’t have to become an expert jazz musician right away – it’s something you’ll always work towards, so just take small steps towards small, daily improvement. Set small goals that you know you can accomplish and eventually work towards longer practice sessions. Start with just 15 minutes a day and then slowly increase it to 30 minutes, then 45, then an hour, etc. It doesn’t have to be a solid block of time. You can practice 15 minutes twice a day or 45 minutes once and the 15 minutes once to get the total amount of time, but regardless of how you do it, try to slowly increase the total amount of time you spend per day. Our second set of music for today’s show is going to feature Bastian Weinhold and Jonathan Butler. The first song you’ll hear is One for the Doctor by Bastian Weinhold from Cityscape and second I’m going to feature Sweet Serenade by Jonathan Butler from Living My Dream . Once again, that was Jonathan Butler with Sweet Serenade and before that was Bastian Weinhold with One for the Doctor. You can find more information about Bastian Weinhold at bastianweinhold.com and Jonathan Butler at jonathanbutler.com. There are great groups online through Facebook and the like that host “daily jams” or “weekly jams.” They pick tunes, discuss them, various recordings of them, and post videos of themselves playing them. It’s a great way to connect with other musicians, be a part of a community, and get ideas. There are also communities like this for songwriting. One example is FAWM, held in February. 14 songs in 28 days. You can post recordings or lyrics, get feedback, collaborate with other composers, etc. It’s a great way to get motivated and get inspired, set a reasonable goal and have the incentive to work towards it. 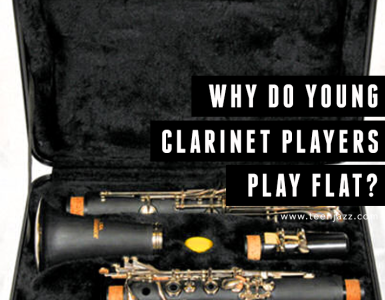 Working with other musicians, or taking part in these sorts of communities is a great way to help you build focus (the other musicians help keep you accountable), and it’s a great way to get critiqued on your playing. If you start to find practicing stale, try changing up your routine with different kinds of practice. If you normally work on improvisation, try sight-reading etudes. If you normally work on transcribing, try reading through Bach cello suites. If you normally read music, try playing by ear. I’ve said it before and I’ll say it again. Actively listening is one of the best ways to learn. In order to truly improve your musicianship, you must listen to as much as you can. Listen to as much music as you can as often as you can. Pay attention to the musicians and what they’re doing and how they’re doing it – and not just the person on your instrument! Listen to the drums, to the bass, to the piano, the strings, the voice, the saxophonist. You can take away something from each part of a recording, you just have to listen for it. Listening will inspire you to play more and play better. When you’re a creative type, you may have experienced something along the lines of suddenly waking at 3 am in the morning with an idea for a song or a lick you want to work out. If that’s the case, don’t roll over and fight that urge by trying to go back to sleep – get up and get it out of your system. Some of my favorite compositions are those that came to me in the middle of the night as I tried to get to sleep. Rather than forgetting about them and letting them go, I got up and got them down (and I slept much better after). Write out a list of goals you’d like to accomplish with your practicing. Both big picture things you’d like to tackle in the long-run and things you’d like to accomplish in the next few weeks. Do you want to do music full-time or do you just want to do it as a hobby that brings in a little extra money? Do you want to work as an artist or go on tour with someone else? I’d love to tell you that you can do whatever it is you set out to accomplish, but it’s really not that simple. Creating a plan, however, does give you clear, actionable steps in the right direction, so I really recommend starting with that. Success doesn’t happen overnight. Just put in regular work each and everyday and that little bit will add up. You can move mountains, but only one wheelbarrow full of earth at a time. There you have it. Our ideas for making practicing or songwriting a daily habit. What do you do to help yourself keep on track? We’d love to hear from you. Please visit us at TeenJazz.com and join the conversation in the comments for the transcription of today’s podcast. Our last set of music for today’s show is going to feature David Pedrick and This Time with Feeling. The first song you’ll hear is Ultimate from This Time with Feeling from Coming Down and second I’m going to feature Ball Vines by David Pedrick from Time Remembered . Once again, that was David Pedrick with Ball Vines and This Time With Feeling with Ultimate. You can find more information about This Time with Feeling at thistimewithfeeling.bandcamp.com and David Pedrick is at davidpedrick.com. Before I close out the show, I’d like to invite you all to check out Teen Jazz if you’re interested in learning more about me, Shannon Kennedy or the community. As I just mentioned it’s TeenJazz.com. Or if you just would like to say hello, come and say hi at our Facebook page – that’s facebook.com/teenjazz. I promise to say hello back! All the links that I’ve mentioned as part of the show will be up on Teen Jazz and Teen Jazz Radio, so if you’re interested in learning more about these talented artists, please stop on by – I know they’ll appreciate the love! You can leave comments on any of our posts at TeenJazzRadio.com. If you’re interested in sponsoring Teen Jazz or our radio show, we have several affordable options available. Please visit teenjazz.com/advertise to learn more. A very special thanks to Jazz and Bossa Radio for featuring Teen Jazz Radio on their web radio station. We recently partnered with them back in May to share our artists with a wider audience and we are excited to have joined the Jazz and Bossa Radio family. You can visit them at jazzandbossaradio.com. All of our Teen Jazz Radio podcasts are featured over at Jazz and Bossa Radio on Sundays at 3pm EST and on Wednesdays at 5pm EST. And last but not least, we appreciate your iTunes reviews! If you’ve enjoyed our podcast, please help us get noticed on iTunes by writing us a review. Let us know if you’ve found our podcast valuable or if you’ve enjoyed some of the music we’ve featured as part of the show. We’re so very thankful for those of you who have gone in and taken the time to write us reviews for Teen Jazz Radio. Thank you again for tuning in the Teen Jazz Radio podcast from TeenJazzRadio.com.